At Parrelli Optical® we are committed to introducing you to the newest and most innovative sunglass lens deigns to both improve your vision and to enhance your comfort. All of our sunglasses can be designed with your prescription or without. We specialize protecting your eyes from the harmful rays of the sun while enhancing your vision. All of our sunglasses offer complete Ultra-Violet light filters. 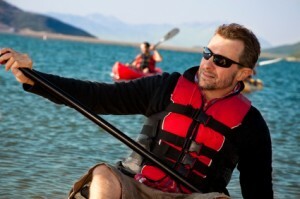 We recommend glare-reducing polarized lenses. We will make specific suggestions on lens color and frame features to meet your particular needs. If you are driving, boating, golfing, mowing, lazing or skiing, no matter what you do, we can design sunwear to improve your performance. improve your vision and enhance your game. Parrelli Optical® is a qualified Oakley® distributor. We work directly with the Maui Jim® laboratory to provide you with their certified products. We offer an exceptional collection of RayBan® sunglasses. Finally, our Nationally Certified Professional Opticians will adjust your sunglasses to assure your wearing comfort. At Parrelli Optical®, we know sunwear.